It begins with the “Crystal Man”, descending onto the stage in a costume made of 4500 small mirrors. It ends with a cast of 45 mesmerising performers coming together to acclaim. I’m under the Big Top at Cirque du Soleil, not for the first time. But TOTEM, the latest touring show to visit Brisbane, is the best I’ve seen. The first half, in particular, has me gasping, laughing and silently amazed. As always, Cirque du Soleil provides a spectacular and theatrical experience. I’m just one of more than three million people around the world who’ve seen this show since it opened in 2010, and I’m pretty sure almost all of us leave the Grand Chapiteau shaking our heads at the amazing athleticism and creativity we’ve just witnessed. I mean, who needs animals at a circus when you can have these incredible acrobats, dancers, actors, and musicians performing for us? The visual effects are stunning and just how some of those contortions are achieved are a mystery. My favourite act was five tiny women riding tall unicycles as they juggled metal bowls, tossing them with their feet and catching them on their heads. Look, Mum, no hands! In another scene, two white-clad roller-skaters (was it a wedding?) spun and twirled on top of a small drum, the woman sometimes almost appearing airborne. The couple next to me whispered to each other: “We could do that!” she suggested, and they shook with suppressed laughter at the prospect. TOTEM has a plot, if you can follow it. The characters and acts loosely trace the evolution of humans from an amphibian state to its ultimate desire to fly, with myths and magic, the odd monkey and a besuited businessman thrown in. Keep up if you can! 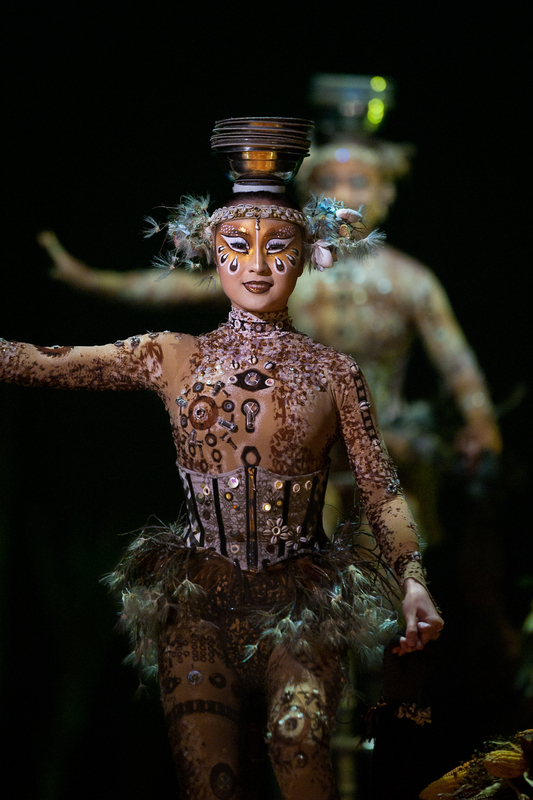 It was also interesting to find a local link in the show: the gorgeously detailed costumes – everything from sequins and mirrors to leather and lycra (and monkey masks) – are the work of Brisbane-born designer Kym Barrett. The Brisbane season of TOTEM runs until May 24, before the show continues its Australian tour to Adelaide (opening June 11) and Perth (opening July 31). A Glass Half Full was a guest of Cirque du Soleil. 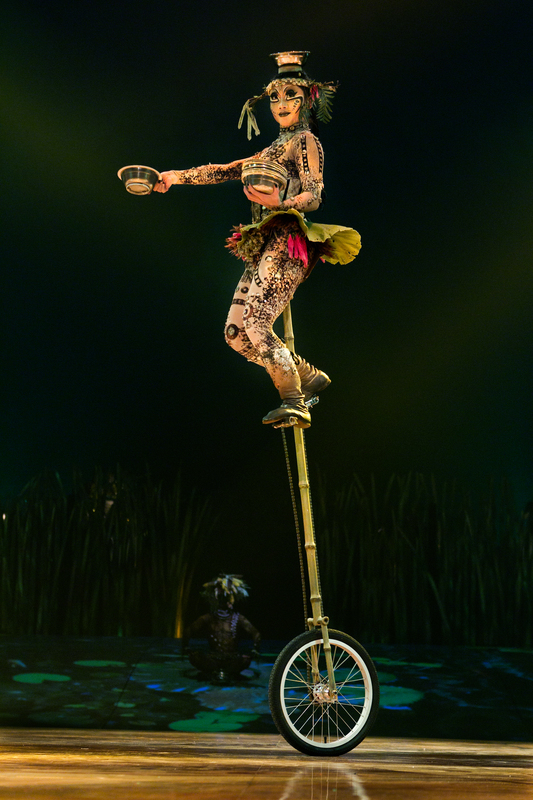 All images courtesy of Cirque du Soleil. The girls on the bikes was my favourite act too! Didn’t they almost defy belief. And I forgot to mention that one of them dropped a plate – but they just smoothly continued. Nobody’s perfect, after all. All that and more. You are so right! The gasps of amazement and roars of approval from the audience said it all. They sure did! Glad you enjoyed it as much as I did, Christine! Oh yes, those men were part of this show too! And it’s so funny to even contemplate “ordinary” people like us trying to do those stunts. What athletes those performers are – I’m in awe. 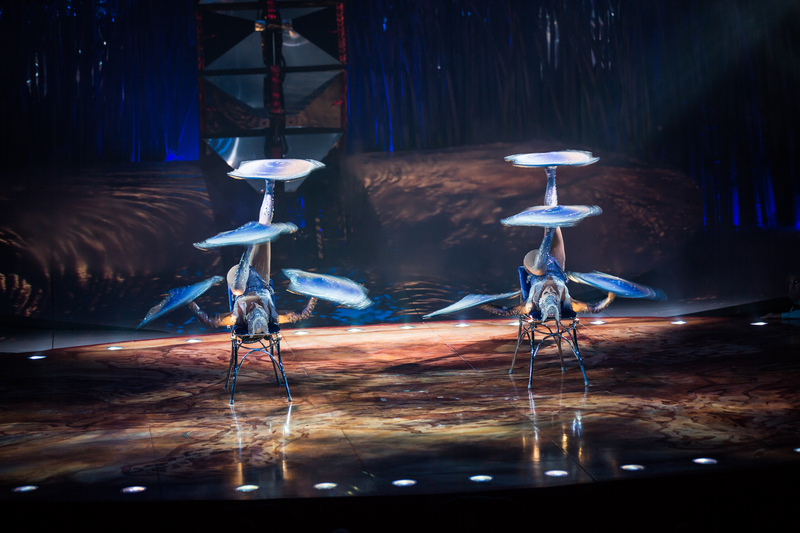 Cirque never fails to hold my interest–and I always come away inspired:). Gorgeous pics Lee. It looks amazing. Thanks, but of course they are not my images (as I note at the bottom). Photography during the show is banned, so these are provided by Cirque.